David Foster is kidding around with his daughter Erin. The 36-year-old Head Creative at Bumble took to Instagram on Saturday afternoon (March 16) to share a conversation with the 69-year-old music producer where he joked around about the college admissions scam. “Thank god you didn’t want to go to college-I’d Be in jail right now! !” David texted to Erin. Felicity Huffman and Lori Loughlin are among a group of people who have been indicted for allegedly being involved in a college admissions cheating scam. Katharine McPhee Opens 'Waitress' in London with Fiance David Foster's Support! Katharine McPhee poses for a photo with fiance David Foster at the opening night after party for Waitress on Thursday (March 7) at Cafe At The Crypt in London, England. The 34-year-old actress and singer stars in the new musical, reprising the role of Jenna after leading the show on Broadway last year. Katharine also posed for a photo with the show’s all-female creative team – composer Sara Bareilles, book writer Jessie Nelson, director Diane Paulus, and musical director Nadia DiGiallonardo. Waitress is currently scheduled to run until at least October 2019 in London, though Kat will finish up her run in May. FYI: Katharine is wearing an Elizabeth Grace dress, Christian Louboutin shoes, and Stephen Webster jewelry. “Far away from each other but still can’t wait to marry you @davidfoster,” Katharine wrote, showing off her engagement ring. 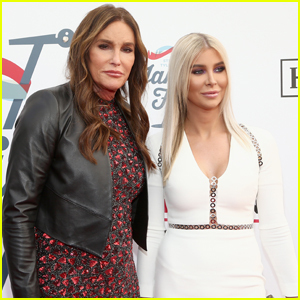 Caitlyn Jenner is Joined by Sophia Hutchins at Steven Tyler's Grammys 2019 Viewing Party! Caitlyn Jenner and Sophia Hutchins hit the red carpet as they arrive at Steven Tyler’s Grammys Viewing Party on Sunday night (February 10) at Raleigh Studios in Los Angeles. The 69-year-old Olympic gold medalist looked pretty in a sparkling red dress over a leather jacket as she stepped out for the party. Other stars at the event included Jane Lynch, David Foster, along with Kelsey Grammer and wife Kayte Walsh. The party benefited the Janie’s Fund – Steven Tyler‘s charity that takes care of abused and neglected girl. Angela Bassett is all smiles on the red carpet as she arrives at Clive Davis’ Pre-Grammy Gala and Grammy Salute Industry Icons Honoring Clarence Avant on Saturday night (February 9) at the Beverly Hilton Hotel in Beverly Hills, Calif. The 60-year-old American Horror Story actress was joined inside the event by husband Courtney B. Vance. 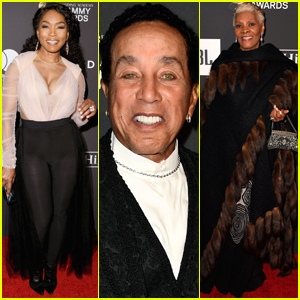 Other stars stepping out for the event included musical icons Smokey Robinson and wife Frances Glandney, Quincy Jones, Dionne Warwick and host Clive Davis, and David Foster. Other stars at the event included LL Cool J and Jazmine Sullivan. FYI: Angela is wearing a Leilou dress and Loriblu shoes. Katharine McPhee leads the way out of Craig’s after dinner on Tuesday evening (January 22) in West Hollywood, Calif. The 34-year-old actress and entertainer was followed close behind by her fiance, David Foster! The pair enjoyed a dinner date that evening. Before driving away, David and Katharine shared a cute moment in their car. If you missed it, Katharine recently shared a video clip of her singing “Lean on Me” with David on the piano! Watch below – they sound amazing!